« Can customers be educated? Jim Collins’s best seller “Good to Great” never finished to bring us all the details necessary to a perfect evolution of a modern company. Understanding that good is in fact, not so good at all, and finally a disadvantage, time has come to raise the level of competitivity of a corporation. Good is not good enough and need to enhance the conscious, but can be enough for lots of people, avoiding them to ask for excellence and greatness. That’s why Jim Collins drove a long years study, discovering and confronting “good” and “great” companies, to understand behaviors and differences of strategies, leading to change. I’d like to share a quick report of the principles keys, shaping the framework of results given by many interviews, meetings and talks with several executives and CEO. Interesting to see how structure, understanding and method can change the way we lead the business dance after digesting these different results. 1) Right people: any adventure you start, you have to play with good guys, right guys in fact; having right resources means not spending lots of money in motivations tools or process, by having DNA motivated guys to follow you, anytime you want. 2) Level 5 leaders: those who you want to follow by heavy weather too, in any situation against all transformations. Charism, good sense and ethic and far beyond basic business goals. Respectable, humble and close to executive, strong and straight decisions and last but not least: consistent. A kind of CEO you don’t forget, to pilot the business bus. 4) Culture of Discipline: when you stare any modern and dynamic entity or try to explain the efficiency of a large corporation, there’s anything but discipline. 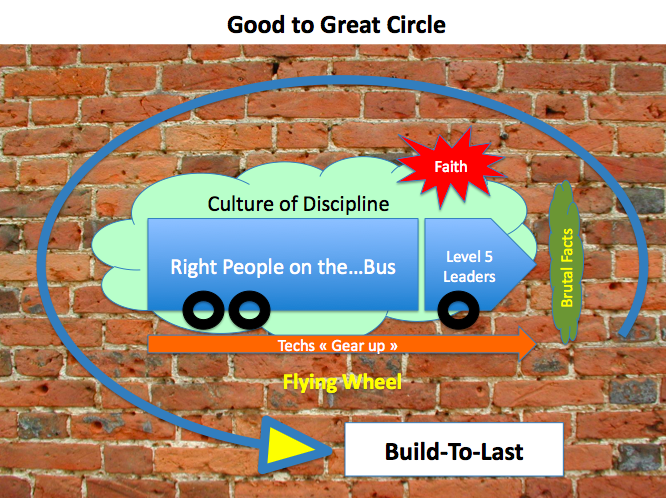 If you have right people on the bus (see 1), you’ll get essence of discipline and motivation inside. Discipline includes organization, report, know all about your own responsability toward each other, a main competency for working in teams and large projects human groups. Army, as a comparison, can show a perfect model of efficiency of discipline when you have to cope with thousands of people on a whole operation to succeed. And if anyone knows his role in the larger project, the bus drives fast, surely and to achievement of initial goals. 6) Faith? Everything in life needs faith. Faith for what you do, try, want, dream. If you stop having faith for what you believe, do or breathe, you won’t be excellent…You’ll miss the essential core of masterpieces. Spiritural side of your projects is important too, to feel the sheer face of problems, solutions and leadership. Any leader (religious, prophet, economic, politic…) has his own hidden side of unknown. But having faith always-on aside makes them more powerful and insightful for future. 7) the ongoing process of turning wheel (sometimes it even flies…! ): when putting so much efforts and energy to get all those elements together, you don’t want to stop the movement. Getting part and involved in a whole shift for change, your old side is over. You nurtured a complex global machine, with each part in a single function, delivering value to the whole process. The inertia that has been generated can’t (must not) be stopped without throwing away all the efforts made so far. Too many changes in business navigation and you’re gonna lose teams and direction…You only make one good impression: the one you are, when you’re driving the change with leadership, success, method and charism.